Physio-Control has announced a merger agreement with Sansio, a provider of software-as-a-service (SaaS) solutions for the emergency medical services (EMS) and home healthcare markets, to expand data solutions portfolio. Through this merger, the two companies will work closely to club their product offerings and develop the next generation of integrated data tools which help customers’ improve patient care and overall system performance. Physio-Control has been providing clinical data and quality improvement tools to hospitals and EMS agencies for many years. These tools include cloud-based LIFENET system and CODE-STAT data review software. LIFENET system is for clinical information collaboration between hospitals and EMS agencies and CODE-STAT data review software is for post event analysis. Sansio has been providing cloud-based SaaS solutions, such as the HealthEMS ePCR (electronic prehospital care report), for healthcare providers. The company has a number of future-ready information management solutions, which help healthcare providers improve their operations and care. Physio-Control president and CEO Brian Webster noted this merger is a key part of a broader data strategy for the company. "Data acquisition, movement, and analysis have become essential to our customers’ operations and we will soon be able to offer them more integrated data solutions. While our existing data solutions are industry-leading, we believe now is the right time to invest to expand our portfolio and take a much stronger position in this area of our business. "We envision a future with tighter integration between data systems and medical devices, the seamless movement of data between EMS, hospitals and the home, and system level analytics that will drive improvement in clinical and operational performance for our customers. "We have been very impressed with the talent of Sansio’s team as well as their extensive pipeline of new products so we are eager to kick off this partnership," Webster added. Financial terms of the agreement, however, were not disclosed. Sanios’ HomeSolutions.NET is a SaaS solution for home healthcare agencies that provides a complete solution from the point of care to the back office. The company’s HealthEMS, a remote-hosted field data collection, management, and reporting software solution, helps fire and EMS providers improve patient care and financial performance. Sansio’s HealthEMS ePCR provides a complete, accurate, and detailed description of prehospital care and is the foundation for the HealthEMS eChart. 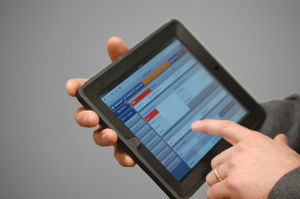 The company’s Patient Triage solution, a fully integrated feature, allows for patient tracking all the way from computer-aided dispatch to the hospital. Image: Sansio’s HealthEMS patient management and reporting solution. Photo: Courtesy of Sansio/BusinessWire.